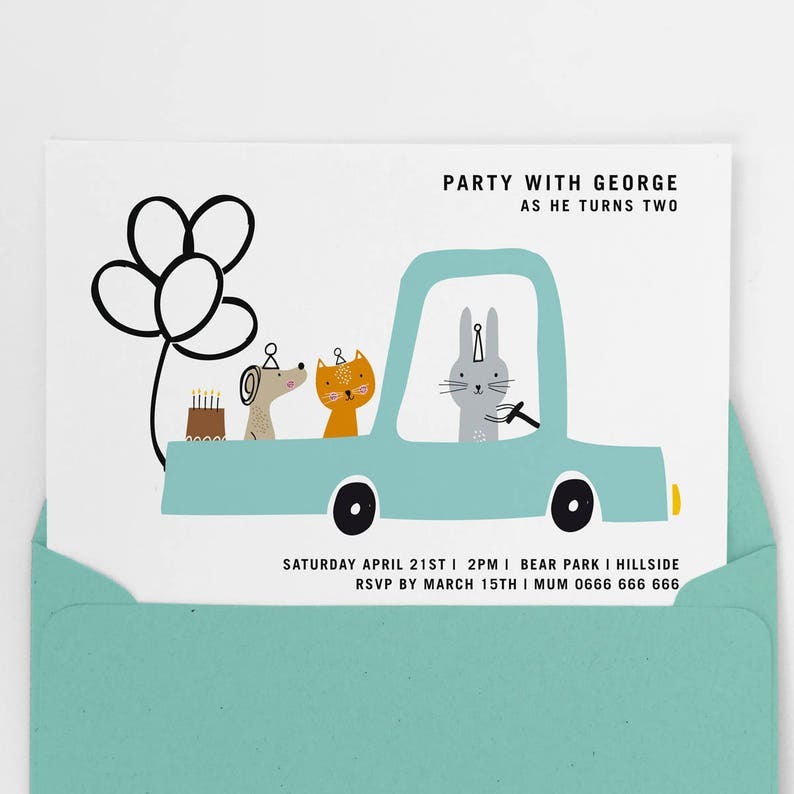 Celebrate your little boy's birthday with this printable party invitation featuring my three illustrated characters on their way to a birthday party. 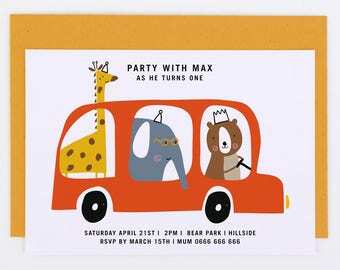 The party invite will be customised with your personal details. Choose a matching thank you note as an add on option! High resolution quality PDF and JPEG files for printing. This listing is for a digital printable file of 4x6 inch (102 x 153mm) or 5x7 inch (127 x 178mm) only. 1. A PDF with a bleed and crop marks - to use if printing at home, work or through a professional print shop. 2. A high resolution JPEG - for email or for printing at a photo developers. This is a printable digital file. You will not receive anything in the post. You can print this file at home, at a print shop like Snap Printing or Officeworks, or online through a print service company. If printing at home I advise printing on a heavy matte card stock. 5. 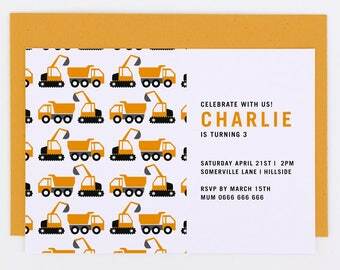 Your invitation will be customized and the files emailed to your etsy email address. Once you have provided all the details above please allow 3 days for your customized file to be emailed to you. Please be aware that screen colors are not the same as print colors. Due to your monitors settings, print colors may be slightly different than what is viewed on your monitor. I do my best to make sure the on screen image is accurate. This artwork is copyrighted by ©Paper and Pickles. This purchase is strictly for Non-commercial, Personal Use only. Mass production, selling, file sharing and commercial use of these files are not permitted. You may not resell, reproduce, distribute by electronic means or profit in any way from this design. All rights reserved. By purchasing this artwork you are agreeing to the terms and conditions. Sorry there are no refunds due to this product being a digital download. 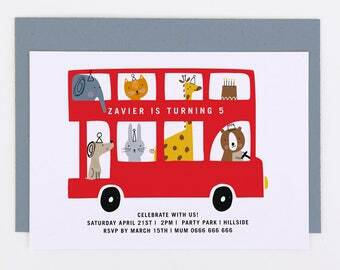 Love the invite for my twins birthday, thanks you!! I accept payment by Paypal. This means that you can use any major credit card, without signing up for a Paypal account if you don't want to. Paper and Pickles is located in Melbourne, Australia. Items will be shipped within 3 business days of receipt of payment. Items purchased on the weekend, will be shipped within 3 business days following the weekend. For larger orders, please refer to the shipping time specified on the product listing. Items within Australia are shipped by Australia Post and should take approximately 3-7 business days to arrive. Other international shipping destinations INCLUDING UNITED STATES can take up to 4 weeks to arrive. To keep costs down, I do not offer tracked or registered shipping, but if you would like this to make you feel at ease, please let me know and I will gladly provide you with a quote. Digital download prints are available immediately following purchase. There will be no refunds issued due to the electronic and instant nature of this item. No items purchased via digital download will be posted. Please keep in mind that computer monitors have slight variances in colour that you see. What you see on your screen may differ slightly from the item you receive.